Aaron found these pretzel rolls at Wegmans. It's a pretzel. It's a roll. What's not to like? Especially when you make it into an egg salad sandwich. Yumms. We have those in the Wegmans in VA and they are fantastic. I like them on their own, while Tony prefers to use them as a base for a roast beef sandwich. It's probably for the best that they have to be eaten quickly. Kelly - is it one of the new Wegmans? Were you thrilled when they put it in? 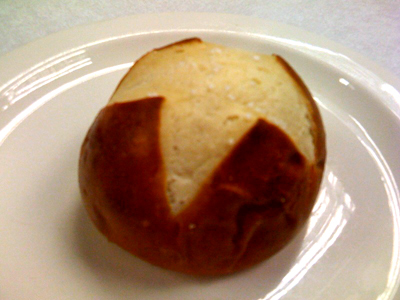 Roast beef sounds amazing for a pretzel roll sandwich! I love pretzel rolls! I miss Wegmans sooooo much. I was drooling over your cupcakes the other day, too. I told Paul the next city we move to MUST have a Wegmans! Yes ma'am! There are 4 in VA now and the closest to me is in Gainesville/Lake Manassas. They opened in November, and while it's at least a half hour drive, I do my weekly shopping there. I come back with better food, a lower grocery bill, and usually a few crumbs on my coat from a pretzel roll or a cinnamon muffin. Oh, and now all of the whole family always want to come along for grocery shopping! when I move to Canada, Wegmans is going to be the thing I miss the most. If you like that pretzel roll you should try the one that Wegman's sells in by their other bread products. It comes as a four pack under the label all twisted pretzel. They started it in their Mechanicsburg, PA store and had so much success they are now releasing it in all of their stores. It is also sold in Redner's, Giant and Weis I know.